Signed and Framed print - 100cm x 50cm - 550 USD During the 1st Test, Pakistan v India at Karachi in November 1989, a quiet 16 year-old named Sachin Ramesh Tendulkar made his Test debut for his beloved India. Unframed and Unsigned print - 80cm x 40cm - 22 USD As a tribute to this outstanding feat, we are proud to release a magnificent, full colour print, titled "Sachin Ramesh Tendulkar 35". ". 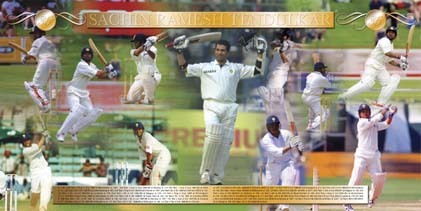 This collage style print contains the details of all of Sachin's 35 Test Centuries, various images taken during his career and also his Record Breaking innings. Unlimited in volume, this piece has been especially created to enable Sachin fans all around the World to be able to own a little piece of this historic achievement. 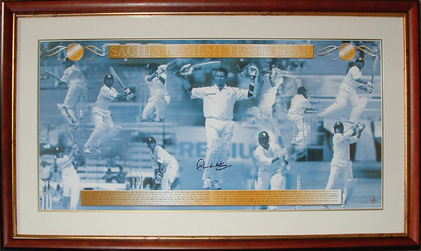 Unsigned and unframed, this print is a very affordable piece of cricket memorabilia. Framed bat - 105cm x 60.5cm - 827 USD As a tribute to this outstanding feat, we are proud to release a limited edition of 1000 of this special piece, titled "Sachin Ramesh Tendulkar 35". 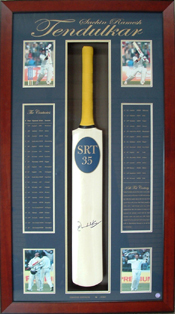 This "SRT 35" cricket bat has been elegantly framed in a quality timber box frame and Perspex glazed alongside four photos of Sachin taken during his World Record innings. 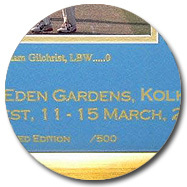 This quality collectable also contains the details of all of Sachin's 35 Test Centuries printed onto the mat board in gold text. 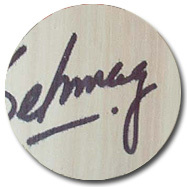 This strictly limited piece of Test Cricket history has been personally signed by Sachin and will be the only signed bat released World wide to officially commemorate his World Test Record. 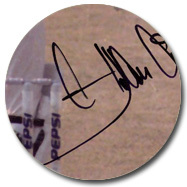 In March 2004, in the 1st Innings of the 1st Test versus Pakistan at Multan in Pakistan, Virender Sehwag became the first Indian batsman to score a triple century. To celebrate the fantastic feat, this magnificent piece of cricketing memorabilia, limited edition of 309 World Wide, has been produced. Each bat has been personally signed by Virender Sehwag and is presented in a top quality timber box frame with acid free archival mat board, To protect your investment, each piece is authenticated by A-Tag Microchip Technology, and comes complete with a Certificate of Authenticity. 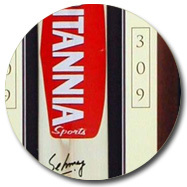 Sehwag 309 Limited Edition of 309 Each bat signed by Virender! 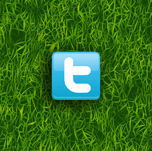 Product will be shipped from Australia and all Taxes and Duties are the onus of the purchaser. Please allow up to 28 days delivery from date of despatch. 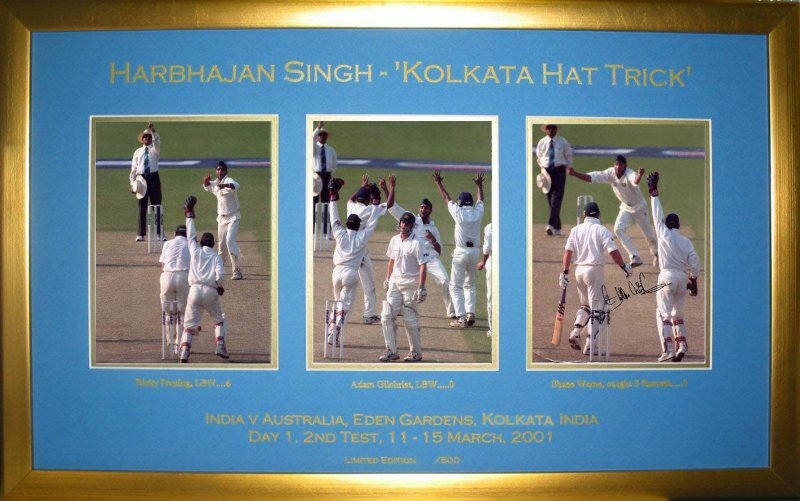 On the 1st Day of the 2nd Test, India versus Australia, in March 2001, at Eden Gardens in Kolkata, Harbhajan Singh achieved what no other Indian cricketer had ever done - he snared a magnificent Hat Trick. With the first ball of his 16th over he trapped Ricky Ponting plumb LBW, with the next ball dismissing dangerman Adam Gilchrist the same way. 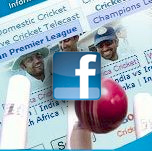 The following ball saw Shane Warne present a sharp chance to Forward Short leg, which was senasationally taken by Sadagoppan Ramesh. 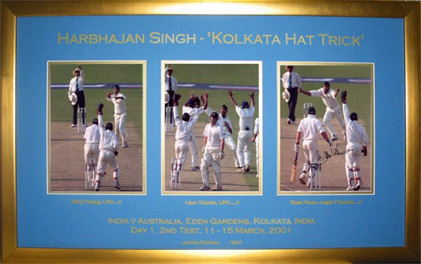 Limited Edition Magnificent photographic collage of the three dismissals with the hat trick at Calcutta capturing photograph in each piece being personally signed by Harbhajan Singh. Each piece .encased in a timber frame with Perspex glazing and is supported by A-Tag microchip authentication technology, and comes complete with a Certificate of Authenticity. 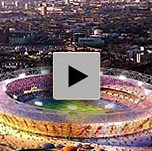 Product will be shipped from Australia and all Taxes and Duties are the onus of the purchaser.